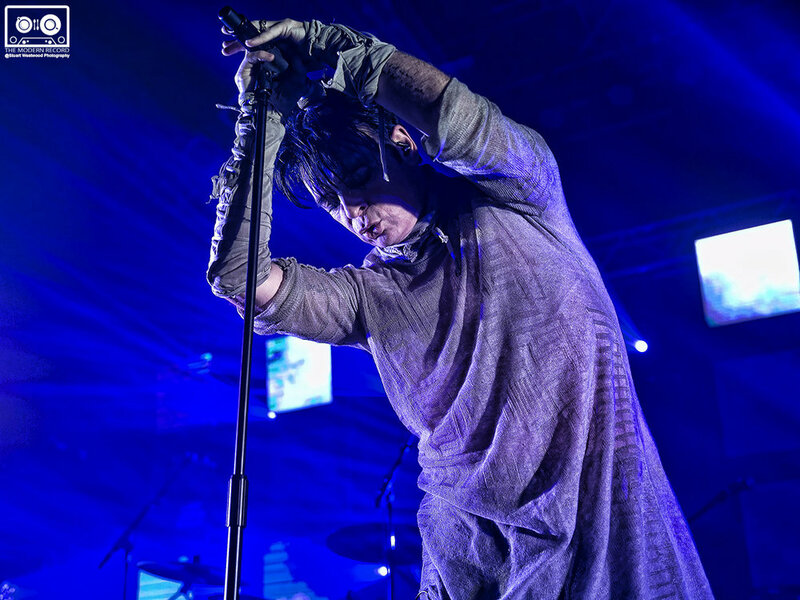 With 4 decades and 21 albums under his belt you would have thought that Gary Numan would have run out of material by now but no… the unlikely goth god who’s iconic image was the result of a light malfunction and thick make up to hided his youthful plooks is back on the road with his 22nd studio album ‘ Savage (Songs From A Broken Word).’ Tonight the Numan leads his entourage of cars into a soggy Glasgow to a sold out O2 ABC. A great support in the form of Jayce Lewis…… *‘Numan Value Range’ if you want but a great set from a band featuring 2 bass guitarists…. Gary Numan and his band take to the stage backed by flames on the massive video displays…. blasting into ‘Ghost Nation’ from the new album, a song based on Numan’s Book about an apocalyptic dystopian future…. the band suitably clad in nomad styled sack clothing. Numan is animated, prowling the stage like a caged animal and ocassional lunging at the Numanoids who are loving it. A set light on material from Savage draws on songs from the earlier albums but with a 40-year career behind you it must be hard to compile a set that pleases all. Outstanding tracks were ‘My Name Is Ruin’ (minus his daughter’s vocals) and ‘When The World Comes Apart’ both from ‘Savage’ Numan is obviously enjoying the new material and performs with vigor, the older material ‘Metal’ and ‘Down In The Park’ is just icing on a brilliant performance from Gary Numan…. Of course he kept ‘Are Friends Electric ‘ right to the end….just in case anybody was thinking about leaving !!! A man back at the top of his game again! !